So it's the big month in a cider maker's year. October, when we press apples to yield juice for fermentation. Fermentation that'll happen slowly over the winter in time for racking and eventual bottling in the spring. Cider making's a waiting game. 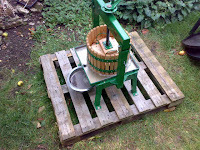 My pressing started in September, though I wasn't pressing then for cider. The first pressing I do is usually for apple juice which I'll pastuerise and decant into plastic milk cartons to be frozen for winter drinking. I usually use cooking apples for that because I like my drinking juice tart; dessert apple juice is too sweet to be refreshing in my view. Besides, the dessert apples can be used for cider and the cookers can't. I'll normally spend three of four weekends pressing, but in 2012 due to the poor yields I only managed two.One in September for juice, and one a week ago in mid October for cider. 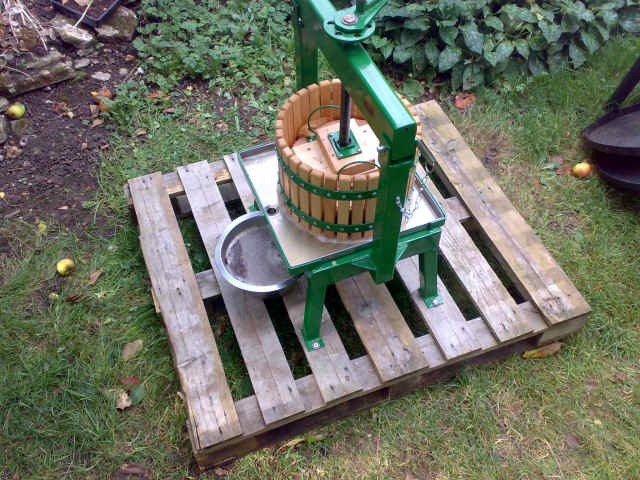 It's a simple enough process, the apples are chopped up in a machine called a scratter before being pressed to release the juice. Our scratter is home made, with a big electric motor driving a spinning stainless steel blade. 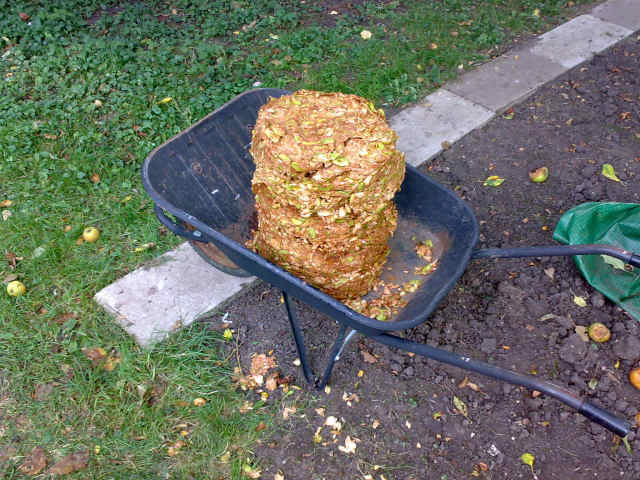 It produces pomace formed from small chips of apple and sometimes very thin apple slices. Whether it would be better if it crushed the apples as well isn't proven, but it at least allows the juice to come out readily enough. Our press is a fairly unexciting Vigo basket press. Not the largest scale set-up, but about right for the size of our harvest and the throughput of our scratter. The juice is collected in a stainless steel bowl before being transferred to the plastic jerry cans I use as fermenters. Our orchard is old so I'll add a bit of yeast nutrient to it as well as some sulphite to kill bacteria. The spent pomace meanwhile goes to the compost heap in a wheelbarrow. One day I'll try steeping it for a second pressing, but I usually just don't have the time. Yeast is another matter. Natural yeast or cultured yeast? To be honest I've used both, often side by side on the same pressing of juice. Both seem to produce good cider, but I've had film yeast infestations with the natural yeasts. Your yeast experience may vary. So there it is. Cider, busily fermenting. The press carefully cleaned, its wooden bits drying out to stop them going mouldy. And I'm thinking ahead to my next task in a couple of months: pruning the orchard in the January frosts.